A detailed independent travel guide to Inner Mongolia, China, with a review of the best Huhhot and Baotou hotels, holiday options, stays in yurts, the Genghis Khan mausoleum, by Helen Dalley, and more from Smart Travel Asia and Dancing Wolf Media. Our Inner Mongolia guide from what's hot in Huhhot to business in Baotou, from grasslands adventures and mutton dressed as, well, mutton, to the best Baotou hotels to park your dusty self. AROUND 1211 the most eminent Mongol of them all, Genghis Khan, caused quite a ruckus, invading China on horseback before ransacking much of Europe. Things have quietened down considerably since. Yet, almost 800 years on, his memory is very much alive and kicking in Inner Mongolia – under Chinese rule for over 60 years. 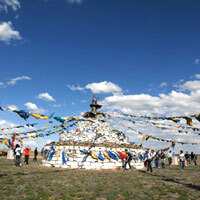 Shrines to the great warrior are still proudly displayed in that Mongolian icon, the yurt, and while the mausoleum in Dongsheng contains mere memorabilia rather than a body, or bones (the Khan requested his final resting place to remain unknown), ceremonies are held here every year to honour his memory. His memory has served to fuel commerce too, and Genghis souvenirs, including stern bronze statues and vivid wall hangings depicting triumphant battles, dominate souvenir stores, and market stalls. While the Mongolian capital Ulan Bator is rapidly losing its rustic identity to western-themed bars – even the Irish pubs have moved in – and restaurants, the same cannot be said of Inner Mongolia’s biggest cities. Situated in the south of the region due north-west of Beijing are the capital Huhhot, and Baotou, the largest urban centre with a population of over two million. Further north is the area’s big attraction, the grasslands, vast green prairies framed by deep blue skies and gently sloping hills. While they attract a steady footfall of tourists (mostly Chinese with a dash of Japanese, Koreans and Western travellers) particularly during the summer months when they are at their greenest, they have not yet been consumed by tourism, and the further north you go, the less populated and more legitimate your experience will be. It would be misleading to assert that Huhhot and Baotou are beautiful cities, yet while they may lack the glamour or charm of other places in China, they possess that ‘on-the-brink-of- something-big’ feel that so many Chinese cities display. Huhhot is the headquarters of dairy giants Mengniu and Yili, and sleek new housing estates are springing up almost every few steps. Baotou is also an important hub as China’s chief producer of rare earth, an important component in the manufacture of technological devices such as TVs and mobile phones. 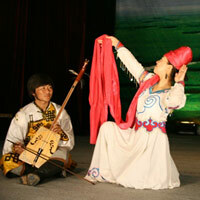 The easiest way to get to Inner Mongolia is via Beijing. Flights from the Chinese capital to Huhhot’s Baita International Airport take around 45 minutes. Baita International Airport opened its new terminal in June 2007 with 11 new parking jetways. Arriving visitors are greeted with big skies that frame the sturdy mountains, and sharp, clean air. Air China, China Southern and China Eastern all fly between Beijing and Huhhot – Air China offers the most frequent schedule. Flights to Baotou are available with Air China as well as China Eastern and Shenzhen airlines. Don’t expect to be fed on the one-hour flight from Beijing to Baotou. Being part of China, Inner Mongolia’s currency is the renminbi, so there are no worries about changing your cash to some obscure currency. The exchange rate is US$1 = Rmb6.21. As with the rest of the mainland, a China visa is required to get into the country, which can be arranged through a travel agent. Depending on what passport you hold, it will cost approximately US$80 to get a 30-day, single-entry visa, and it takes about four days for most travel agents to process this. Once you are there, credit cards are widely accepted, particularly in the larger establishments. The biggest travel agent in the area is the China International Travel Service (www.cits.net), who will arrange trips to the grasslands for a reasonable fee. If you don’t have someone from your hotel coming to pick you up from the airport, then don’t fret, as it’s not an expensive deal. The city is only 15km away and the trip will cost Rmb5 by airport bus (it leaves from the CAAC office) or Rmb25-Rmb30 in a taxi. Buses are tricky if you can’t read Chinese script – none of the timetables or bus signs are displayed in English. A useful bus is Number 1, which departs from the train station out to the old town. Baotou is almost as accessible as Huhhot from Beijing. A taxi ride downtown from the airport will also cost around Rmb30. Once established with accommodation, look out for the Number 5 bus, which you can catch at Namwenwai Dajie in the east, to the city’s other major district in the west. 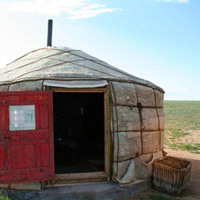 When you visualize Mongolian accommodation, you can’t help but think of yurts, those emminently portable cylindrical-shaped tents once used by nomads to move around the great prairies to find grazing for their herd. The locals, incidentally, mostly live in stone or concrete structures these days, and the yurts seem more for the eyes of curious tourists, certainly near the cities. Luxury hotels are thin on the ground, although this situation is changing, with many esteemed brands looking to establish a base here. The Shangri-La Huhhot has already arrived – and with it a new level of luxury never seen in these parts before. It’s the first genuine international five-star Huhhot hotel brand and is situated near the commercial centre overlooking a swathe of green that is Qingcheng Park. Shangri-La’s 375 rooms include 63 Horizon Club rooms offering personalised check in service, and a Club Lounge where you can take breakfast in the morning and cocktails by night. 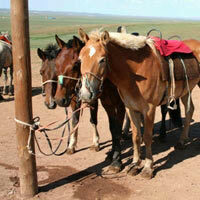 With rooms a minimum of 38sq m, there’s (almost) room to march a Mongolian horse in and out. For breakfast and lunch, head to Xin café, where you can sample tangy Mongolian cheese and salty milk tea for breakfast if you’re feeling adventurous. For other local specialties, as well as spicy Hunan dishes, head to Shang Palace, the most upscale restaurant in town. The hotel has the city’s largest ballroom, with a floor space of 1,620sq m. This is easily one of the best Huhhot hotels around and a good address for leisure – or business, if you insist. Another useful five star Huhhot hotel is the Inner Mongolia Jinjiang International Hotel, a huge affair with 1,000 rooms. This chain of hotels is well regarded across China and is the largest hotel group in the country, with more than 400 hotels to its name. In the sumptuously decorated Lobby Bar, faded portraits of old Chinese celebrities dot the walls and old Shanghainese tunes play quietly in the background. The check-out time of 2pm is handy if you wish to indulge in more than one nightcap. The hotel’s location near both the train station and the airport ensures that it sees plenty of business delegates pushing though its doors, and this capacious property has meeting rooms able to house up to 500 people. Other facilities of note include an indoor swimming pool, sauna, fitness centre, spa and massage centre. There is also the family-friendly Holiday Inn Huhhot, where children eat free at the Café Champs-Elysees, which serves up Asian and Western food from a well-stocked buffet. Offering high speed Internet access from Rmb8, the business centre is staffed between 7am and 11pm, and has everything from a courier service to your own private limousine. 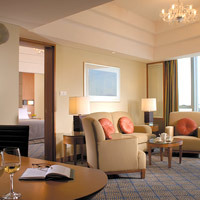 Guests in executive Club Floor rooms receive a daily complimentary cocktail and lunch snacks, while the suites have their own kitchenette. Another Huhhot hotel option is the Phoenix, a 280-room local four-star business hotel with comfortable, well-appointed rooms. An airport shuttle is provided to all guests. Like Huhhot, Baotou, Inner Mongolia’s largest city (and one of China’s 30 biggest), has very few recognisable brands located in the city with the exception of the Shangri-la Baotou. This hotel is situated near the deer enclosure in front of the pleasantly landscaped Galaxy Square. Baotou translates as ‘deer city’, and there used to be many prancing around these parts. These days, the deer are tame and you can feed them carrots if you feel so inclined, although it is doubtful that the government officials who pour into the hotel from the city’s swish new government offices located nearby have time for such frivolity. As with the Shangri-La property in Huhhot, all rooms are at least 38sq m, and offer soothing green views of the botanical gardens, or Baotou’s bustling cityscape. For long-stay visitors, the hotel has 11 serviced apartments. Another Baotou option is the low-rise, 106-room Comfort Hotel, which is part of the US-run Choice Hotels chain. Adjacent to Central Square and within walking distance of the Baobai market and city centre plaza, it’s home to one of Baotou’s most upscale drinking establishments, the Lux Club, one of the only places in town serving drinks until 2am. Feeling emboldened by the booze? Then blast your lungs out at the Karaoke lounge. There is also a Chinese restaurant, the Comfort Place, if you don’t want to venture on to the streets of Baotou. As the hotel mostly serves business travellers, all rooms come with their own desk, and free local calls are also available. Standard rooms, business rooms and luxury rooms are all equipped with 32-inch LCD TVs, and wireless and cable Internet access. Another place worth seeking out is the 17-storey Baotou Shenhua International Hotel, if only because it has its own bowling alley. If being king pin isn’t your thing, then take advantage of the fact that you can enjoy round the clock room service. This 288-room property has spacious rooms, the largest being 40sq m. A more modest option is the three-star Haide Hotel, which features well-appointed executive, luxury and presidential suites decked out in a warm, contemporary decor that’s still difficult to find in many locally-run Chinese hotels. Facilities include a massage room, sauna and underground parking. Outside the major cities, it’s easy to find accommodation in the grasslands, particularly in Gegentala. 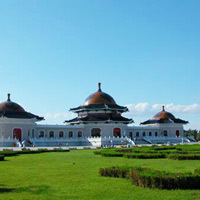 One popular option is the Gegentala Grasslands Tour Center, a two-and-a-half drive from Huhhot. While undeniably touristy – the endless rows of concrete yurt-shaped accommodation is more akin to a Mongolian-themed caravan trip than a night spent as a herdsman – at least you don’t have to rough it, as they have their own toilets, plus great views of the sun slowly sinking into green. Be warned that the beds provide little in the way of comfort (think boarding school-style hard) although unlike traditional yurts, they do have the luxury of electricity so you can have a shower, and a cuppa. Like the accommodation, the entertainment is hardly authentic and tries to cater to the mainland Chinese crowd a little too much. The amplified sounds of guitars, fiddles and brittle singing voices drove away foxes and many birds indigenous to the grasslands long ago. Still, the sky is bright with stars, a pleasant atmosphere prevails, and there are a couple of bars on site where you can pick up a bottle of local beer for as little as Rmb9. Farther afield (around a three-and-a half-hour drive from Huhhot) is the Huitengxile Grassland Tourist Center, which has eight different resorts including Qingsong in the pine trees, and Huanghua on the grassland belt. It’s an almost identical set-up to Gegentala, with well-equipped yurts and Mongolian-themed meals and entertainment, although being farther away from the city, it’s not quite as busy. If you’d rather go more rustic and stay in a proper yurt far from the tourist crowds, then either head up north to Xilinhot near the Mongolian border, or ask your travel agent if they can tailor a package to suit your needs. If you can speak Chinese, another option is to approach a taxi driver, who may be able to arrange a night or two in a more authentic setting. While KTV prevails (those Mongolians sure love to sing) there is unfortunately a distinct lack of bars in Huhhot… but explore and you will find some saving graces, like the Lan Tian Club (1/F Dongda Plaza, Dizhibeijie, tel: [86-471] 525-5500), which is just a few minutes’ walk away from the Shangri-La. Cross the road, walk straight, and you’ll see it on your left. Lan is a stylish place to sit and drink, or simply collect your thoughts for a while on its high-backed furry chairs. Or opt to stare at the sparkling light fittings dangling from the Victorian-high ceilings after you’ve looked at the titles lining the book shelves. You can also peer through the velvet drapes at passers-by over a Cuba Libre or a cognac (drinks start from Rmb20). It’s more of a sleek drinking establishment than a restaurant, but if you’re craving western-style food after all that mutton, then dig into some steak, or order a pizza. If you leave even a modest tip, you may find the staff running after you, thinking you have forgotten your money. Sweet. To get more of a taste for the local food, check out Xiaofeiyang Huoguocheng (Xilin Guole Yu, tel: 668-7799), a chain that serves remarkably good lamb hotpot, and Malanqin Fandian (Julong Changjie, tel: 691-7738), for buckwheat noodle dishes. In Baotou, Menggudaying, situated on the inner city grasslands in Qingshan district (Saihantala Park on Construction Road, tel: [86-472] 517-4111), offers private dining yurts where businessmen like to take their clients and show them good old fashioned Mongolian hospitality. This begins with placing coloured silk scarves round a guest’s neck (usually blue or white) and drinking the local rice wine, baijiu, which is surprisingly smooth compared to maotai. Then there’s a special Mongolian toasting: first, put your finger and thumb together, point to the earth, then the heavens. Next, trace a fingerful of the spirit across your forehead, and then drink it all in one from the silver cup. Horsehead fiddlers – some as virtuoso as Eddie Van Halen move their fingers as fast as a Mongolian steed at full tilt, providing the perfect backdrop to the sound of rich, deep Mongolian singing. Food is also impressive. Alongside plates piled high with mutton, there is plain tangy yoghurt, tasty meat and vegetarian dumplings, and shredded potato mixed with local greens. Back in Baotou city head to Tiexi Paiguguan (8 Nanmenwai Daijie, tel: 416-7001) for the noodle soup, and gigantic beef ribs, or, just down the road, Hongfuda Fandian (19 Nanmenwai Daijie, tel: 414-4157), which also serves hearty noodle soup. While many of China’s cities grow increasingly expensive, it’s still possible to snap up a bargain or two in Inner Mongolia if you’re looking for a hip memento or two, particularly if you head to Lao Jie (Old Street) in Huhhot, where you can scour the dimly-lit, low-rise souvenir stores for bargains. The leather goods are good value: cowboy hats are a steal at just Rmb6, and wallets and belts are also a good bet; they are high quality and the price is right. This tightly packed street is also the place to pick up your Genghis Khan memorabilia. No one needles you into buying, so you can shop at leisure. Similar souvenirs can be found in Baotou’s markets. If you’re looking for edible gifts, then pick up a bottle of the local firewater, baijiu, or some milk-based sweets. On a more contemporary note, some major brands are moving into Huhhot including Nike, Swatch, Adidas and Levis. You’ll find these brands in and around the vicinity of the Victory Shopping Centre, which is open until 8pm. In summer, when the grasslands are at their busiest, opening hours extend till 9pm. Inner Mongolia’s grasslands are this area’s biggest draw. Characterised by wide skies and acres of rich open prairie, it’s China at its most natural and magnificent, swathes of lush green and rich blue, tempered by wispy thin slivers of cloud. The roads are good and straight and not too bumpy for the most part. It’s reassuring to see that there is an extensive tree planting project taking place, hopefully ensuring the area stays looking as good as it currently does. 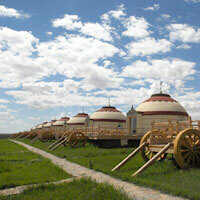 The grasslands may feel remote, but they are easily accessible from Huhhot. Driving to Xilamuren takes around one-and-a-half hours, while Gegentala and Huitengxile are an hour more. 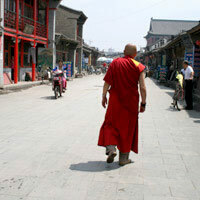 Day tours cost around Rmb200 and about Rmb270 for an overnight stop. The grasslands can become a little crowded (especially from July to September), but there are still plenty of untouched prairies for you to enjoy if you’re prepared to wander a bit off the beaten path. Alternatively, saddle up a steed and ride through the fields, drinking in the views. While charging through the grasslands with the wind running through your hair is something of an unlikely scenario – most of the horses are more interested in grazing than galloping – it’s still a worthwhile experience, particularly in the summer, with the sun beating down on your back. At Aobao Hill in Gegentala, tie a silken scarf to a piece of rope at the lamasery as you make a wish and burn some incense, all while standing in front of your Chinese star sign. Wander further afield from this point on the grasslands and see proper yurts, (made of cloth, not concrete) complete with colourful shrines to Genghis Khan and brightly painted furniture. A more modern attraction is the Huhhot Natural History and Culture Museum, a gleaming structure with an adjoining theatre. The museum houses everything from colossal dinosaur structures to displays on China’s space programme, but it’s not the exhibitions so much as the building which is of particular interest, heralding a new modern era for Huhhot. 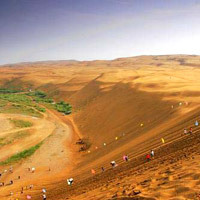 Around an hour’s drive from Baotou and at the northern tip of the Kubuqi desert lies Xiangshiawan, also known as the Singing Sand Ravine, as you can supposedly hear the sound of cars or planes as you pad through the sand, legs wrapped in cloth up to your shins (they protect your feet from the scorching sand). While it’s a wonderfully romantic notion, you cannot actually hear anything like this, only the quiet whooshing sound your feet make as you pull them out of the soft yellow earth. Never mind. Take a camel ride and imagine you’re in the Sahara instead. The camels are tame and all tied together so you don’t have to worry about them running off, and they’re much more obedient than the grassland horses, who try and pause to graze every few minutes. And if the tame camels are a bit on the well, tame, side, hop on a wooden tray for an adrenalin-rushing ride down the 110m hill. Remember to take sunglasses and a scarf to avoid getting a faceful of sand. Then, of course, there’s Genghis Khan’s mausoleum in Dongsheng. What could be a more fitting way to end your trip to the region than by mulling over this warrior’s weighty legacy? China International Travel Service. Nei Menggu Fandian. Tel: [86-471] 230-8056, (www.cits.net). China Travel Service. Inner Mongolia Hotel, 31 West Wulanchabu Road. Tel: [86-471] 696-4 233. China International Travel Service. Corner of Shoaxian Road and Shifu Donglu. Tel: [86-472] 511-6824. China Travel Service. 20 Wu Lan Road, Tel: [86-472] 211-8966. Shangri-La Huhhot. Tel: [86-471] 336-6888, fax: 336 6666, (e-mail: slhh@shangri-la.com or www.shangri-la.com). Inner Mongolia Jinjiang International Hotel. Tel: [86-471] 566-6 666, (www.jinjianghotels.com). Holiday Inn Huhhot. Tel: [86-471] 635-1888, fax: 635-0888, (www.ichotelsgroup.com). Phoenix Hotel Huhhot. Tel: [86-471] 660-8888, fax: 628-0959, (www.ni-phoenix.com.cn). Shangri-La Baotou. Tel: [86-472] 599-8888, fax: 599-8999, (e-mail: slbt@shangri-la.com or www.shangri-la.com). Comfort Hotel. Tel: [86-472] 515-6688, fax: 518-1819, (e-mail: hotelhelp@choicehotels.com or www.comfortinn.com). 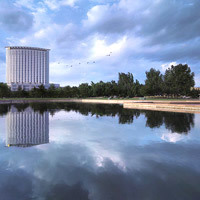 Baotou Shenhua International Hotel. Tel: [86-472] 536-8888. Haide Hotel. Tel: [86-472] 536-5555. Gegentala Grassland Tour Center. Tel: [86-474] 544-8000. Huitengxile Grassland Tourist Center. Tel: [86-474] 821-9068.